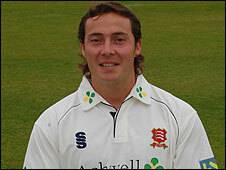 Essex all-rounder Graham Napier has been ruled out for the rest of the season with a back injury. Napier, 30, has played in just four County Championship matches this season, and has a stress fracture that will keep him out until December. To add to Essex's woes, Ryan ten Doeschate will miss the rest of the FP t20 campaign with a torn calf. The Netherlands all-rounder, 29, sustained the injury earlier this month and could be out for up to eight weeks. Coach Paul Grayson said: "Both injuries are obviously a setback to our campaign. "Ryan was having the season of his life and Graham never really got a consistent spell in the side after being hampered by injury."